This exhibit represents all thirty-eight federally recognized American Indian tribes currently associated with Oklahoma. 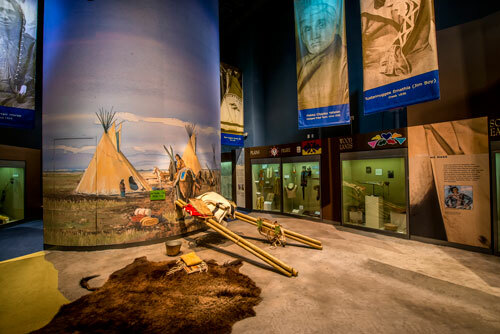 The ONEOK, Inc. Gallery offers visitors the opportunity to explore the historic past of the native peoples of Oklahoma as well as experience contemporary American Indian cultures. Using the twentieth-century American Indian experiences as a bridge between the past and the present, the exhibit offers artifacts, tribal music, photographs, American Indian art, and oral histories from the indigenous people of Oklahoma. This gallery includes dedicated exhibit space allowing each tribe to interpret their own history to the public. Each of these small venues is a cooperative effort between the tribe and the Oklahoma History Center. Caddo Leadership and Community is the result of a cooperative effort between the Caddo Nation Museum and the Oklahoma History Center. The Caddo Nation Museum provided the interpretation, graphics, design ideas, and artifacts for the area. The staff of the Oklahoma History Center provided tools, material, and technical expertise for the installation and creation of graphic panels. 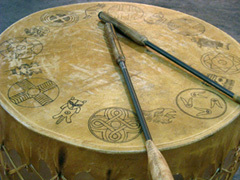 Within this exhibit, visitors are presented with information regarding Caddo history, the Caddo Turkey Dance, and artifacts from their traditional homelands. These artifacts are a core piece of the interpretation of the geographic expanse that the Caddo confederacy once covered. Included is a pot from Craig Mound at Spiro, two chert points from a village site in Louisiana, a pipe from Battle Mound in Arkansas, and a replica of a shell gorget from a village site in Texas. The original Texas gorget is too fragile to move from its current storage location. Also on display is a cast replica of an effigy pipe from Spiro Mounds. This pipe commonly referred to as “Big Boy” or the “Resting Warrior,” features the carved figure of a kneeling man wearing heads for earrings.